Below is a short list of references to organizations that seek to promote and/or support digital literacy. These resources have been placed in a table with notes (see below) that can be searched and sorted. Note that the table has multiple pages; pagination links appear at the bottom of the page. Benton Foundation. “Benton Foundation | About Us.” Accessed October 25, 2016. https://www.benton.org/about. Cohen, Daniel J. “Roy Rosenzweig Center for History and New Media.” Accessed December 5, 2016. http://rrchnm.org/. Digitallearn.org. 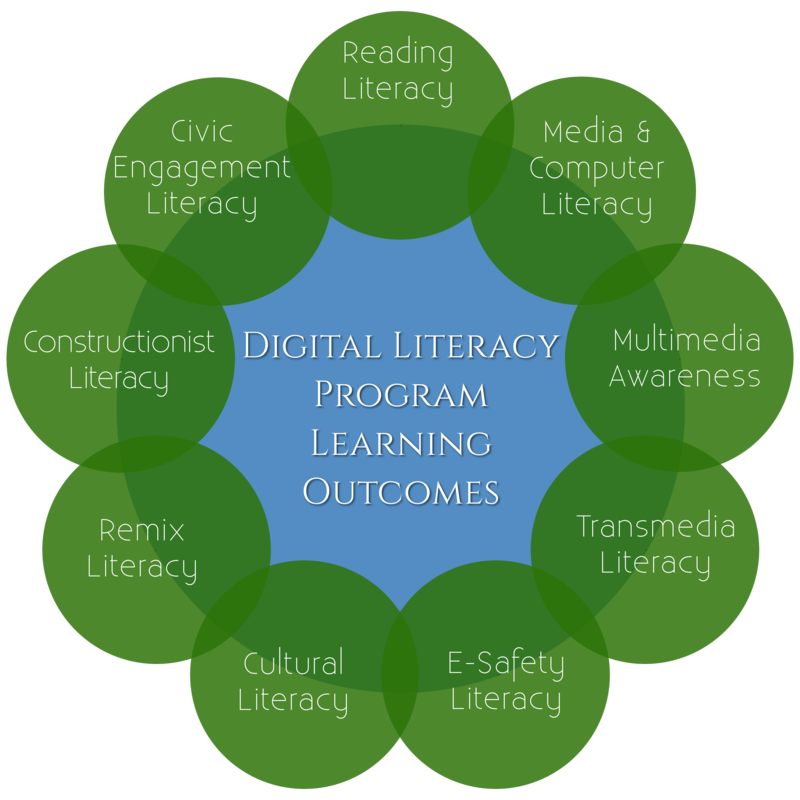 “Digital Learn.” Accessed October 25, 2016. https://www.digitallearn.org/. ECDL Foundation. “European Computer Driving Licence Foundation | About Us.” ECDL Foundation, 2016. http://www.ecdl.org/index.jsp?p=93&n=94. ———. “European Computer Driving Licence Foundation | About UsICDL for Life.” ECDL Foundation, 2016. http://www.ecdl.org/index.jsp?p=98&n=217. Edge. “Edge | Benchmarks.” Edge. Accessed November 15, 2017. http://www.libraryedge.org/benchmarks. ———. “Edge at a Glance | Edge.” Edge. Accessed November 15, 2017. http://www.libraryedge.org/about-edge/edge-at-a-glance. Educause. “Educause Site Search for ‘Digital Literacy.’” Educause, November 15, 2017. https://www.educause.edu/search?q=digital%20literacy. Everyoneon. “Connect2Compete | EveryoneOn.Org.” Accessed October 25, 2016. http://everyoneon.org/about/c2c/. ———. “EveryoneOn.Org.” Accessed October 25, 2016. http://everyoneon.org/. Massachusetts Digital Literacy and Computer Science Standards Panel. “Massachusetts Digital Literacy and Computer Science Standards Panel – Science, Technology Engineering, and Mathematics (STEM).” Accessed October 25, 2016. http://www.doe.mass.edu/stem/standards.html. “Pew Research Center | Internet & Technology,” 2017. http://www.pewinternet.org/. The Denovati Group. “Denovati Group | SMART Resources: Digital Literacy.” The Denovati Group (blog). Accessed October 25, 2016. http://denovati.com/smart-resources/digital-literacy. The Public Library Association's new site, DigitalLearn.org, is an Institute of Museum and Library Services grant-funded project to create an online hub for digital literacy support and training. The site launched in June 2013 and is intended to build upon and foster the work of libraries and community organizations as they work to increase digital literacy across the nation. DigitalLearn.org was originally undertaken in partnership with ALA's Office of Information Technology Policy and Chief Officers of State Library Agencies, along with representatives from national agencies, state libraries, public libraries, community organizations, and many others. Included in DigitalLearn.org is a collection of self-directed tutorials for end-users to increase their digital literacy, and a community of practice for digital literacy trainers to share resources, tools and best practices. In 2016, a new updated version of DigitalLearn.org launched in partnership with the Chicago Public Library. This partnership brought new functionality to the site, including the ability to stand up custom sites for organizations like the Chicago Public Library. In addition, 2016 will bring a new community of practice and updated courses to the site thanks to the ALA Office for Diversity, Literacy and Outreach Services. Through partnerships with local internet service providers, EveryoneOn is able to offer free or $9.95 home Internet service in 48 states and the District of Columbia. We work with device refurbishers, so individuals and their families can purchase discounted devices, including $150 tablets and $199 laptops. We collaborate with libraries and nonprofits to advertise free computer & internet courses at more than 8,000 training sites across the country. By calling 1-855-EVRY1ON or visiting everyoneon.org, users can discover the closest class in their communities. Connect2Compete (C2C) is EveryoneOn’s program that provides affordable Internet and devices to low-income populations, including students and families that qualify for the National School Lunch Program. C2C is offered in partnership with leading cable companies including Cox. Eligible customers receive fast, affordable Internet for as low as $9.95 per month (plus tax). For most customers, there is no deposit required, contracts to sign, or installation or modem rental fees. The Benton Foundation works to ensure that media and telecommunications serve the public interest and enhance our democracy. We pursue this mission by: 1) seeking policy solutions that support the values of access, diversity and equity; 2) demonstrating the value of media and telecommunications for improving the quality of life for all; and 3) providing information resources to policymakers and advocates to inform communications policy debates. Denovati Digital enhances the success of individuals and organizations in the Digital Era by providing strategic and tactical solutions and guidance, as well as training and coaching services. Denovati’s primary brands are SMART Solutions, SMART Learning, and SMART Resources (where SMART = Social Media And Related Technologies). SMART Solutions help individuals and organizations function more efficiently and effectively in the Digital Era through the design and implementation of innovative and leading-edge strategies and programs. SMART Learning services include digital literacy training and other digitally-focused education for individuals and groups, both in person and online, as well as digital coaching. SMART Resources offer in-depth treatment of a variety of topics related to the applications and implications of social and digital technologies. These resources provide both strategic and tactical guidance for individuals and organizations. They include SMART Articles, as well as white papers, guides, research reports, and graphically-oriented pieces that provide at-a-glance information. The Department is collaborating with the Massachusetts Computing Attainment Network, (MassCAN), an alliance of organizations advocating for computer science in school, on the development of voluntary Digital Literacy and Computer Science Standards for Massachusetts schools. A review panel, representing diverse perspectives, was formed to guide this work. The panel reviewed existing computer science standards and the current Technology Literacy standards. The panel met from June 2014 through May 2015 to draft Digital Literacy and Computer Science standards. This page is helpful for thinking about the goals and objectives of our new AA in Digital Literacy program.
. . . to enable proficient use of Information and Communication Technology (ICT) that empowers individuals, organisations and society, through the development, promotion, and delivery of quality certification programmes throughout the world. This is accomplished by various means, including vendor-neutral, modular courses at beginner, intermediate, and advanced levels, for individuals; employers; and teachers and students. Syllabi for these modules are available in pdf format. Certification is available in a variety of areas. The Roy Rosenzweig Center for History and New Media (RRCHNM) is a multi-disciplinary team that develops online teaching resources, digital collections and exhibits, open-source software, and training in digital literacy and skills. Edge is a groundbreaking, first-of-its-kind management and leadership tool, helping libraries create a path for the continuous growth and development of their public technology services. Through an easy-to-use suite of tools, Edge supports libraries in making strategic decisions and identifying areas for improvement. The Edge Toolkit provides libraries an overview of current public services and community engagement. From operations to partnerships and programming, the toolkit generates recommendations for implementing best practices to align with future growth and community priorities. It also provides useful resources to demonstrate the library’s community service to community leaders. Edge was created with the vision that all people should have opportunities to enrich and improve their lives through open access to information, communication, and technology services provided by public libraries. Led by the Urban Libraries Council, the Edge Initiative was developed by a national coalition of leading library and local government organizations and funded by the Bill and Melinda Gates Foundation. Aug 22, 2017 ... This is a follow-up to its 2016 strategic brief on digital literacy. This session will review the state of digital literacy, based on extensive research, interviews with thought leaders, and the NMC 2016 survey and 2017. Through completing the Edge Assessment, libraries evaluate their current services and identify opportunities for improvement. The Edge Assessment evaluates the library’s public technology services. Through the assessment tool, libraries understand best practices in technology-related services for their communities and determine what steps they need to take to improve their public technology programming. Libraries provide programs and services that enable people to get value from their use of technology. Libraries are a valuable community resource and a strategic partner in helping people and communities improve their quality of life. Libraries manage resources so that members of the community who need or want access can get it regardless of ability, skill, personal technology, or available time. Each category has benchmarks for specific practices. Success on each benchmark is determined by a set of indicators that provide information about the library's progress. By working through the assessment, a library sees, on different levels, an overview of current programs, where services are effective, and where improvements can be made. As a result of the benchmarking activity, Edge provides libraries with a suite of tools as well as training to put strategies into action.